The Sports Kolache: I'm BACK! .... with a short post ... literally. I want to first apologize for the infrequency of posts in the last few days. Between a trip to the great white North (Chicago), a 39th birthday, and that little show that I do, I've been jam packed. The good news is that I have a ton of items to post and will do so in the next 24 hours. 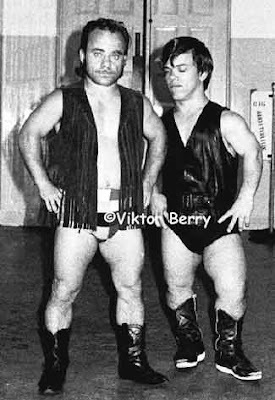 The first one I wanted to get onto the blog was this story about a fraternity at Northwestern University (or the "University of Northwestern", as Coach Holtz calls it) that is under disciplinary review for booking a midget wrestling group called the Half Pint Brawlers for a rush event. "any action taken or situation created, whether on or off university premises, to produce mental or physical discomfort, embarrassment, harassment, or ridicule for the purpose of affiliation with a group, team, club, or their organization." Yeah, that's hazing all right. Thing is the people experiencing the discomfort and ridicule were getting paid to do so and (I'm pretty sure) are not members of the Delta Upsilon frat. In fact, if you ask the little guys, they had a freaking BLAST!! One of the performers from Half Pint Brawlers, "Puppet the Psycho Dwarf," wrote in an e-mail to The Daily that the show was booked about one month ago. "Little Justice (another performer) and myself had a great time at the event," he wrote. "The kids really seemed to enjoy the show." Personally, I'm a huge fan of midgets. Midgets are on the short list of things that always -- and I mean, ALWAYS -- make any situation they are inserted into automatically better. (For the record, I would include pizza, chicks in thongs, and honey roasted nuts on that list as well.) And they are ALWAYS funny; I'm talking laugh out loud, can't miss funny. The only other thing you can say that about is Claymation characters. But don't just take my word for it .... see for yourself! And if you think I'm getting Puppet booked for my show next week ... well, then you know me too well. Happy B-Day, dude. I enjoy your blogspot. I've been to the Half pint brawlers show and I have to say it is worth the money.